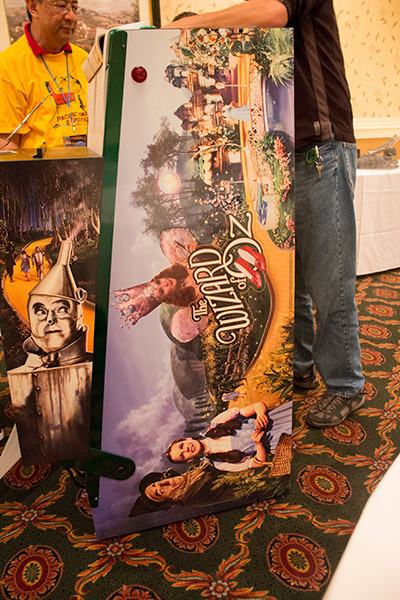 The latest public showing of The Wizard of Oz took place this weekend at the Pacific Pinball Exposition in San Rafael, California, and Pinball News was there for the machine's unboxing and set-up. 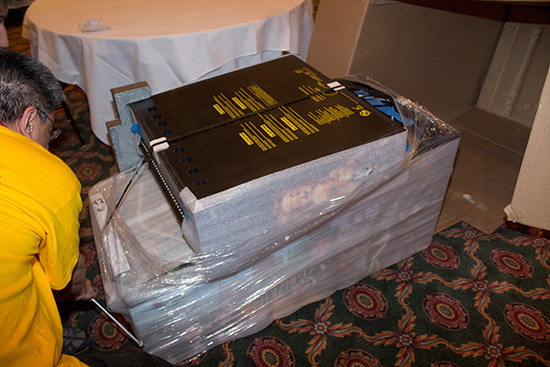 There was some initial concern when it appeared the box had been dropped by the shipping company, damaging the outer packaging (which was of a different design to that which will be used when the machines ship). Whether there would be any damage to the game inside would be revealed shortly. The shipping label on the box declares the total weight of the consignment as 170kg or 375lbs, while another label tells the inquisitive not to open the box until Jack is present. 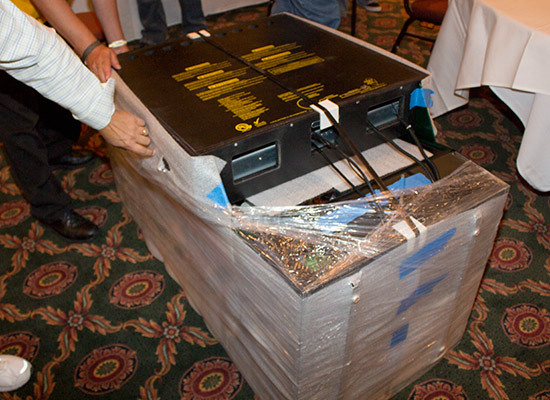 He arrived Friday evening, and so set-up could begin ahead of his seminar the next day. 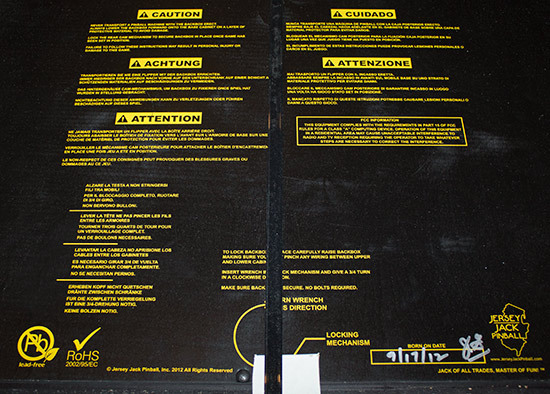 There are several notices printed on the rear of the machine's backbox. 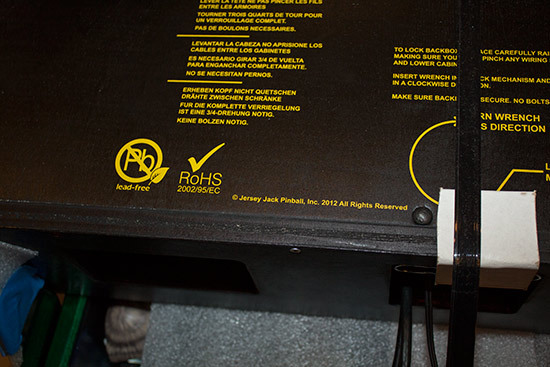 The usual safety information warns of the danger of transporting the game with the backbox raised, while there is also a lead-free symbol, a RoHS one, the JJP logo and a 'born on' date. The machine was then lifted onto its back so the front legs could be attached. 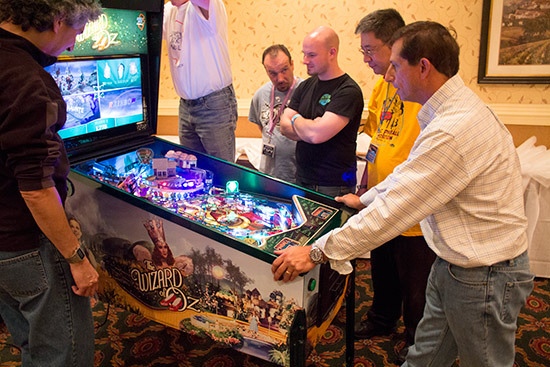 The feel of the cabinet is unlike any other game, with a clear coat layer producing an exceptionally smooth and reflective playfield-like surface. It was then placed on a trolley so the back legs could be bolted on too. 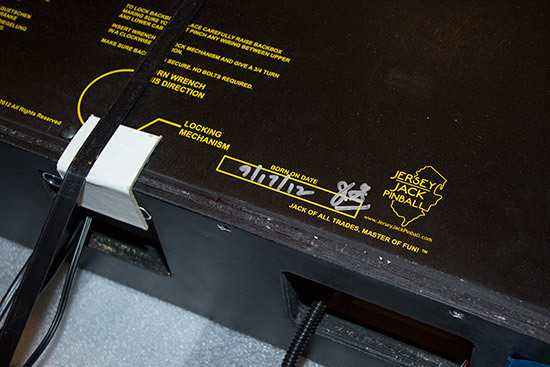 Finally, the backbox could be raised to inspect for any damage incurred during shipping. A custom apron topper had been installed, containing the Pacific Pinball Exposition's logo in the pricing card tray and the tray for the owner's plaque. The signatures on the apron topper had been reduced in intensity from the earlier version, and are now light green rather than white. 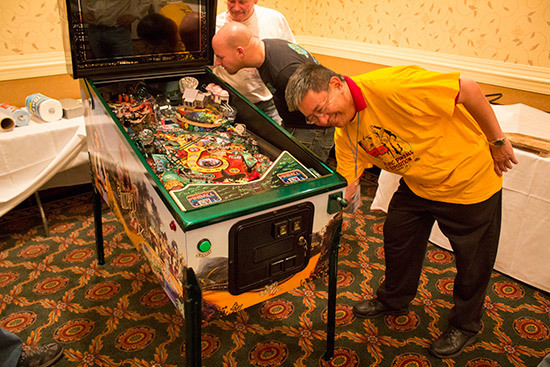 Then it was the moment of truth as Ron Chan from the Pacific Pinball Museum's Board of Directors switched on the machine. 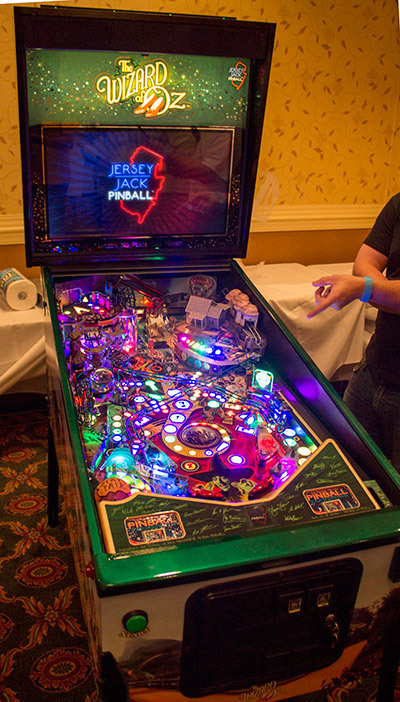 One of the first things you notice is the intensity and vibrancy of the LEDs used in the game. All playfield lighting uses RGB LEDs, allowing any 'lamp' to be one of 16.7 million colours. The LEDs in the backbox are white, while those on the top for the topper are green. Third-party aftermarket mods to make these multi-colour or twinkle are likely to be popular with owners. The LCD monitor's regular gameplay display shows four objectives to complete. 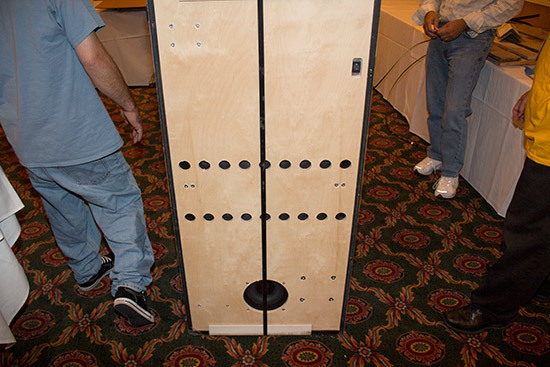 At the top left are the three Winkie Guards, representing by the drop target at the centre-top of the playfield. Each hit knocks down one of the guards until all three are down, when the ball can be shot into the upkicker behind and then kicked up to the Witch's Castle mini playfield at the top left of the game. 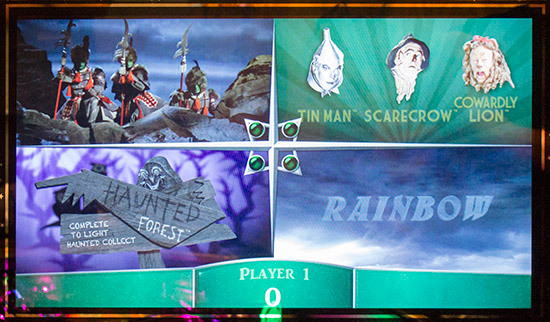 Top right of the display are the Tin Man, Scarecrow and Cowardly Lion. 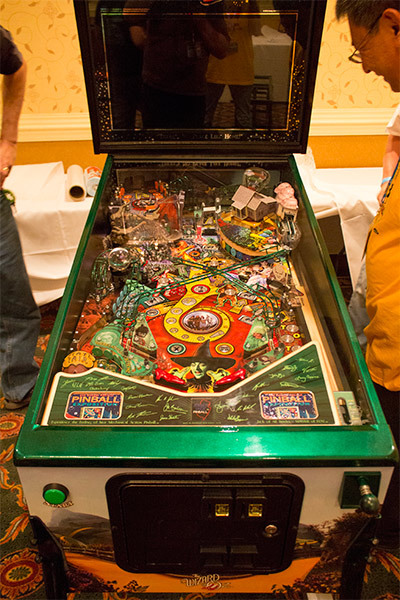 Each of these has a button rollover switch in the centre of the playfield, and rolling over one of these adds a letter to the appropriate character's name on the display. 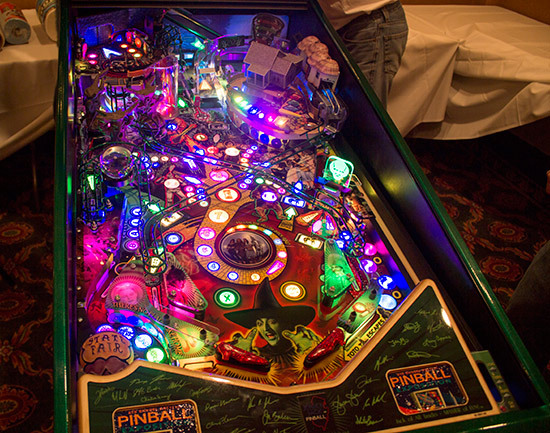 When all three are completed, lock is lit on the ramp for Emerald City multiball. 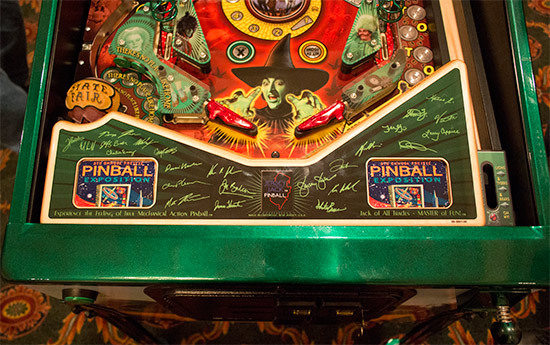 Bottom left is the Haunted Forest where hits on the standup targets in the pop bumper area adds letters to enable the Winged Monkey at the very top of the playfield to grab the ball and transport it to the Witch's Castle. Finally, the bottom right quadrant shows your progress as you collect R-A-I-N-B-O-W letters from the standups below the Munchkinland mini-playfield at the top right of the game. 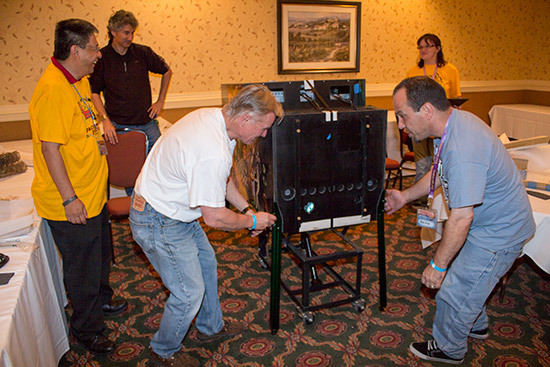 The software in this machine was a long way from complete, so many of the features were unavailable and the display only showed a small percentage of the animations and effects which will be included in the final game. 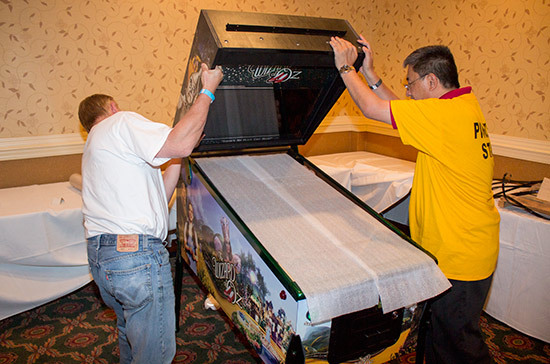 However, we are able to bring you a video of the game being played, including the Emerald City multiball build-up and completion. The video was shot in full high-definition 1080p, so you may want to choose a higher quality setting using the cog icon, and make it full-screen using the frame icon. Alternatively, you can watch it on the YouTube site here. 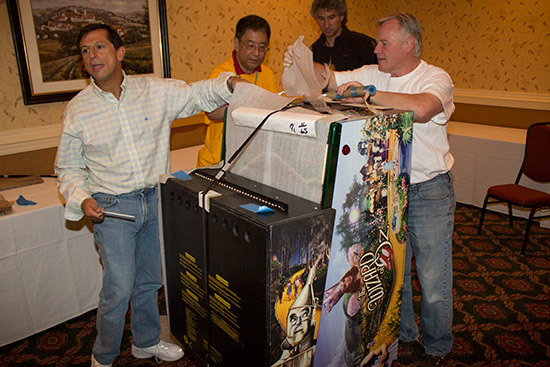 We will be bringing you much more on The Wizard of Oz, including Jack's seminar at the Pacific Pinball Exposition very soon, right here at Pinball News.